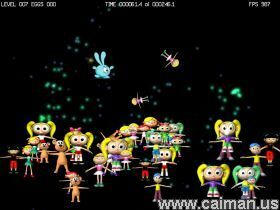 Caiman free games: Easter Generation by Deckard. The object of game: help rabbit to break all eggs as fast as possible. There are 30 levels of game and different eggs with different behavior. It's very easy to break an egg in the game (hmm, like in real life), but it is not very easy to finish all levels faster then 500 seconds. So little children can play the game and the game is still interesting for adult gamers too (I hope). Space - fire by shooting star. - This game is loaded with effects. Highly animated figures, explosive particle effects, advanced physics, etc. - Sound effects fit great. - The whole thing runs unbelievably fast. - Its really not much more than a tech demo. - The difficulty is insanely easy. - The whole game is rather short. It only took me about 5-10 minutes to finish the whole thing. The Little Eggy That Co.
Classic Pacman - Happy .